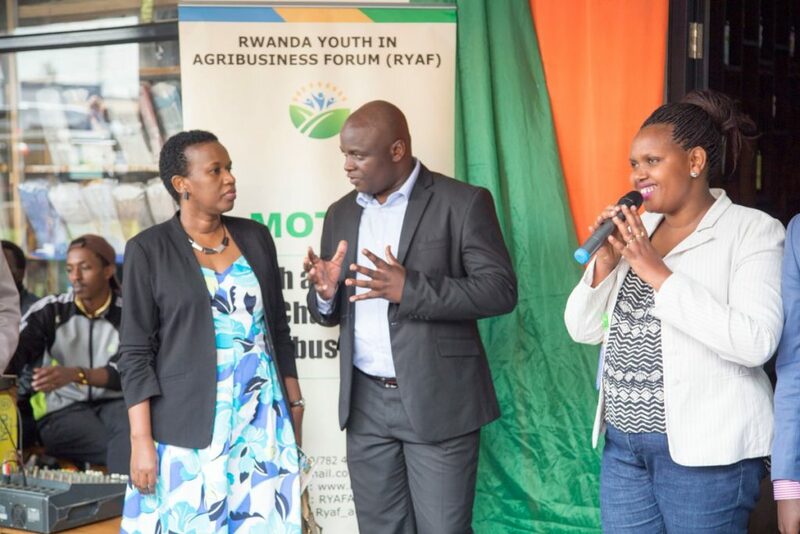 Minister of Public Service and Labor (MIFOTRA) Fanfan Rwanyindo has urged youth on joining Agri-business career “because it is no longer a cheap choice as some have perpetuated such a negative stereotype. She gave these remarks while inaugurating Rwanda Youth in Agri-Business Forum’s shop, which is expected to increase RYAF’s market. 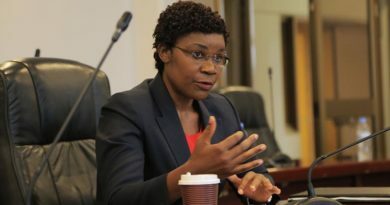 “There are some people who have negative mindset towards Agri-Business, thinking that it is not a smart profession, you have to change that negative mindset because we have many testimonies on superior and numerous entrepreneurs who have shown a impressive progress in Agri-Business” She said. She added that not only Agri-Business increases lives of its practitioners, but also it is an open room to decrease the rate of unemployment nationwide. 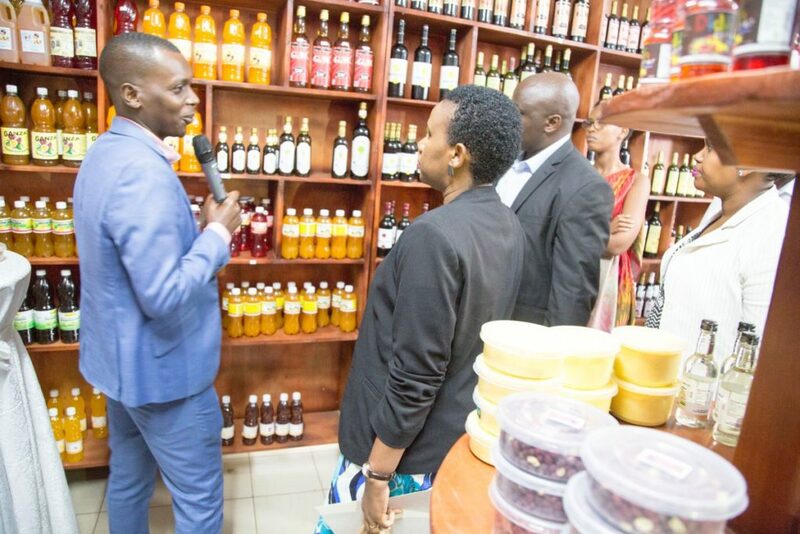 Regis Umugiraneza, vice-chairman of RYAF explaining contents of the shop. 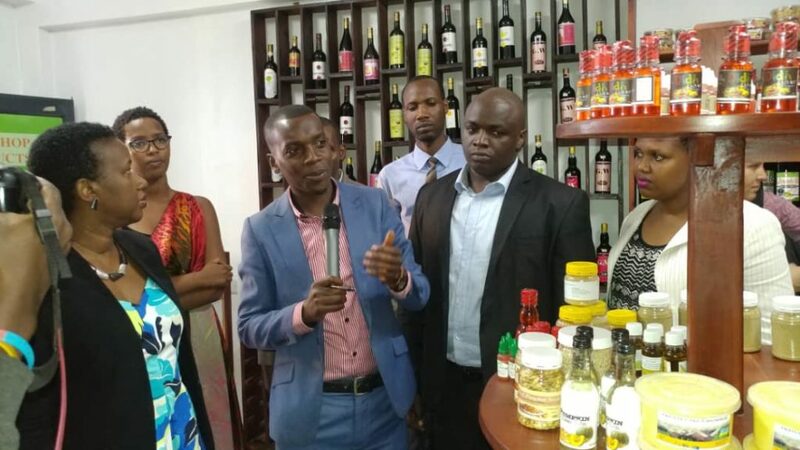 The shop, located in Kigali, Downtown, contains Made in Rwanda agricultural and livestock products, which is evidence for some visionary youths despite others who are often claiming about youth unemployment and lack of fundamental investments to start their own dealing. “It is a great honor for us to see such a milestone, this shop will increase your business and of course a positive testimony to your peers clients who will witness what other youths have produced and learn a lot from you” Min. Rwanyindo added. 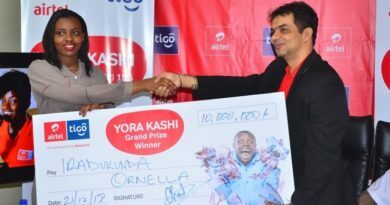 According to some members of RYAF, who have experienced challenges to put on the market their products, this shop is going to be a great opportunity for them as it will ease their doing business. 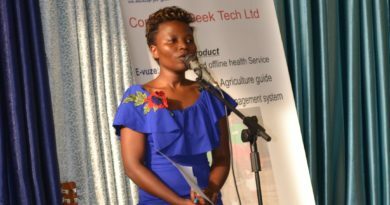 “After closing my Secondary studies in Construction, it was hard to get a job and preferred to plant pineapples and produce juices, now I am progressing but I have been experiencing challenges of selling, this union market will help me to get closer to customers and share ideas with my peers” Said Nahimana Donatien, a young entrepreneur from Rutsiro. Jean Baptiste Hategekimana, Chairman of RYAF states that they have a long-term project of augmenting more youths in Agri-Business and various categories of Rwandans will gain from that improvement. 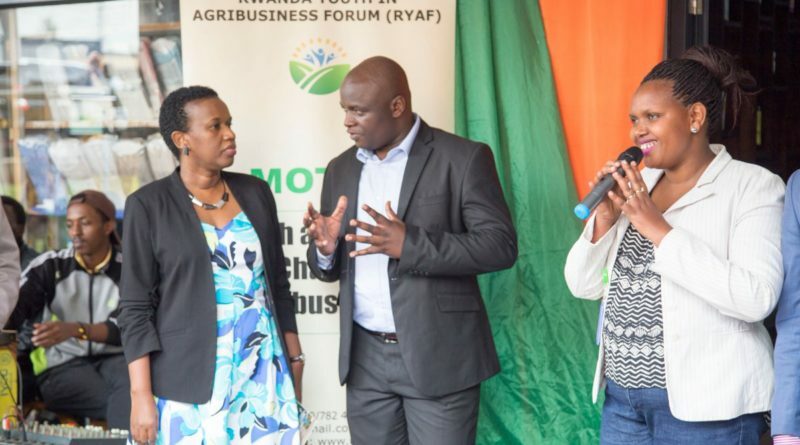 RYAF Chairman Jean Baptiste Hategekimana explaining the efforts of Youth in Agribusiness to Minister Rwanyindo. “If a street vender spends ten hours with a basket of oranges, mangoes, legumes on her head, heated by the sun, those products immediately lose their principals vitamins and they turn into poison, we do not want our people to chomp through such items of consumption, that is why we have opened this shop to solve such matter and of course to help our youth members grow higher financially.” He said. 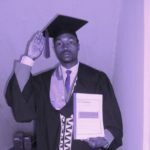 He continued calling other youth to join RYAF to entirely eradicate poverty and unemployment. 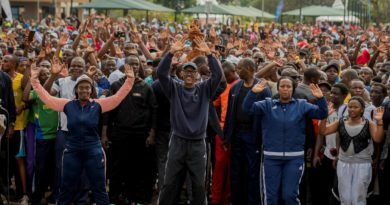 “It is so unfortunate to see young people, early morning standing at centers and closing their arms, which means they do not have what to do the whole day and night, it is whereby you see them stealing women’s bags. We want to get rid of such behaviors by creating more jobs in Agribusiness, once someone has a pineapple plantation, the period between its growing and selling, there are so many jobs to a variety of people” Hategekimana added. The products of RYAF members contain Rwanda Standard Board certification (S-Mark), that guarantees them to be international traders. 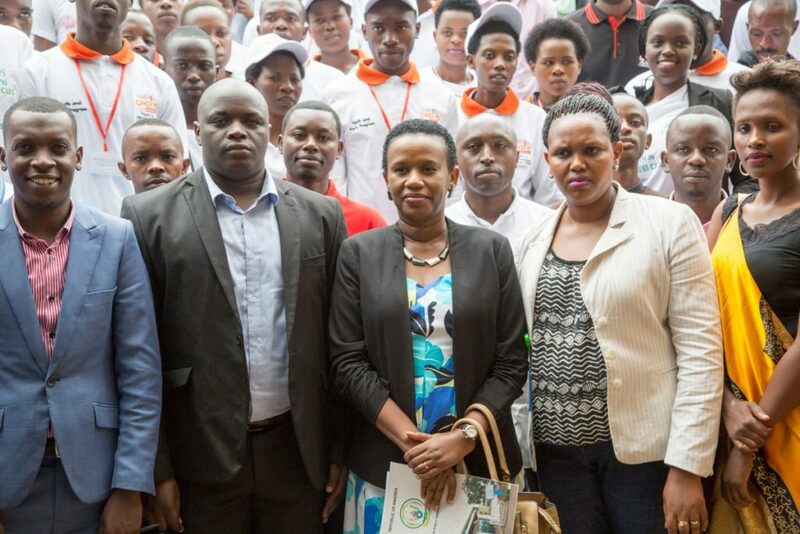 RYAF Chairman Jean Baptiste Hategekimana with Minister Rwanyindo in a group photo with RYAF members.